I finished THREE quilts this weekend! 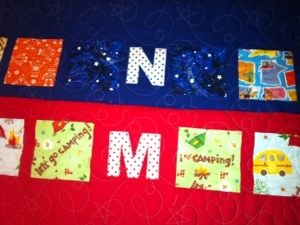 The kids camping quilts are finally DONE! I started working on them in April and they’re finally all done! Here is a post from May about them. I would have been done much sooner if I hadn’t had such problems finding the border and binding fabric for The Pink One’s quilt. Now that they’re finished, I’m glad I got exactly what I wanted (even though it took me 3 orders!). 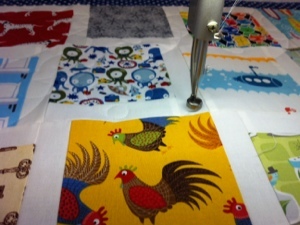 On Aug 6, I dropped both quilts off to be long-armed. 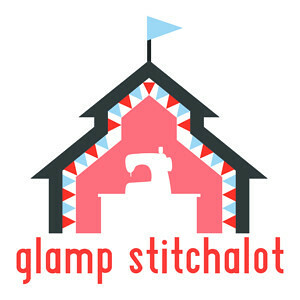 I had a date scheduled for Aug 25 to go long arm a different quilt, but it was quickly becoming apparent that I wasn’t going to have anything finished in time. I asked Lucy to quilt The Pink One’s quilt and leave The Blue One’s for me to do on the 25th. 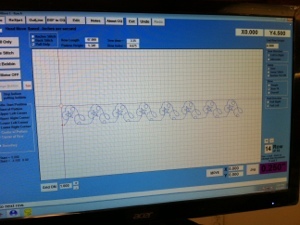 Yesterday I used the compuquilter and it went really quickly. I also stitched the binding on the front of the quilt while it was still on the frame a that way I had a head start because I’m a known procrastinator when it comes to adding the binding. Since I finished the 2nd binding at 10 p.m., I’ll try to get some pictures in the daylight tomorrow of the entire quilts. I never told the kids I was making these for them. Last night, The Blue One asked if the one I was working on was his, so I asked him why he asked. He pointed to the N and said, ‘that’s my initial.’ So I’m guessing he won’t be too surprised! PS – These are only 2 of the 3 quilts I finished – there is one more that I completed, but that’s a separate post entirely. You’ll have to check back for that one! 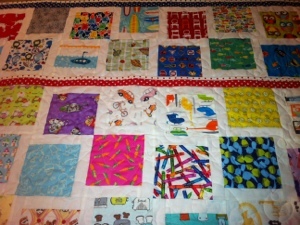 This entry was posted in Quilts and tagged iSpy. Bookmark the permalink.